Subject: Modification of Circular No. 1 of 2014 in view of substitution of Service Tax by Goods and Services Tax (GST). The Central Board of Direct Taxes (the Board) had earlier issued Circular No. 1/2014 dated 13.01.2014 clarifying that wherever in terms of the agreement or contract between the payer and the payee, the Service Tax component comprised in the amount payable to a resident is indicated separately, tax shall be deducted at source under Chapter XVII-B of the Income-tax Act, 1961 (the Act) on the amount paid or payable without including such Service Tax component. 2. References have been received in the Board seeking clarification as to what treatment would be required to be given to the component of Goods and Services Tax (GST) on services, which has been introduced by the Government with effect from lst of July, 2017 and into which the erstwhile Service Tax has been subsumed. 3. The matter has been examined. It is noted that the Government has brought in force a new Goods and Services Tax regime with effect from 01.07.2017 replacing, amongst others, the Service Tax which was being charged prior to this date as per the provisions of Finance Act, 1994. Therefore, there is a need to harmonize the contents of Circular No.1/ 2014 of the Board with the new system for taxation of services under the GST regime. 4. 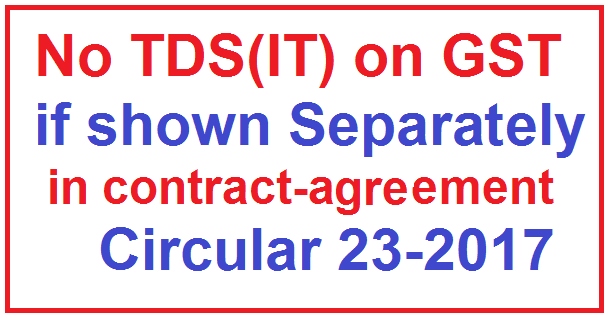 In the light of the fact that even under the new GST regime, the rationale of excluding the tax component from the purview of TDS remains valid, the Board hereby clarifies that wherever in terms of the agreement or contract between the payer and the payee, the component of GST on services' comprised in the amount payable to a resident is indicated separately, tax shall be deducted at source under Chapter XVII-B of the Act on the amount paid or payable without including such GST on services' component. GST for these purposes shall include Integrated Goods and Services Tax, Central Goods and Services Tax, State Goods and Services Tax and Union Territory Goods and Services Tax. 5. For the purpose of this circular ,any reference to "service tax" in an existing agreement or contract which was entered prior to 01.07.2017 shall be treated as "GST on services "with respect to the period from 01.07.2017 onward till the expiry of such agreement or contract.